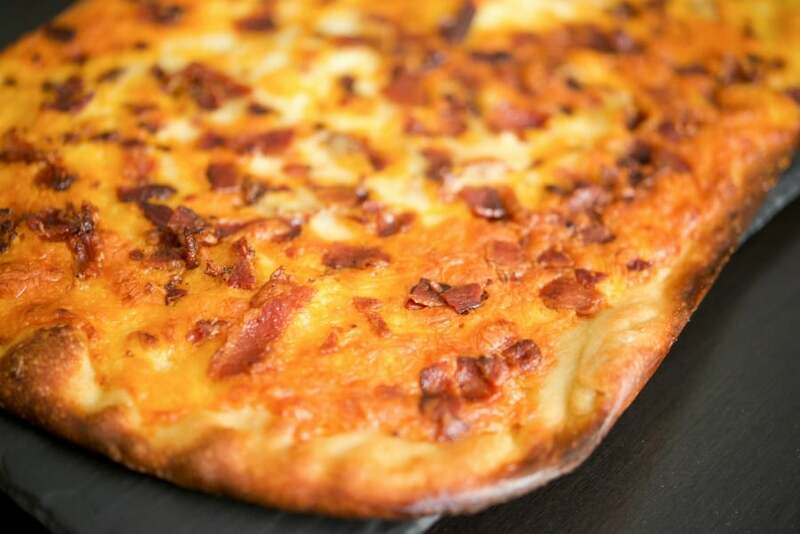 Bacon & Cheddar Flatbread made with your favorite pizza dough, crispy crumbled bacon and shredded sharp Cheddar cheese with a creamy horseradish sauce. For the longest time I couldn’t eat bacon. Seriously, not at all! When I was in college I used to eat platefuls of it drenched in maple syrup. I know, it sounds gross, but even though I attended a culinary school, the food wasn’t the greatest and I was young, stupid and well, it just plain tasted good so why not? After years of indulging in my fat laden breakfast ritual, I must have poisoned my system and couldn’t eat any cured byproduct without getting a MAJOR migraine headache. It’s not the worst thing in the world since all of those types of foods: bacon, hot dogs, cold cuts, etc. aren’t really healthy for you anyway. However, every now and then when my family was craving a large Sunday breakfast of bacon and eggs, I’d sneak a piece of bacon, pop a few Excedrin Migraine tablets and knew that it was going to be a low key/low noise level kind of day. After over 25 years of withholding from these types of foods, and with the new nitrate free products on the market, I can now occasionally indulge in bacon without getting a headache…YAY! 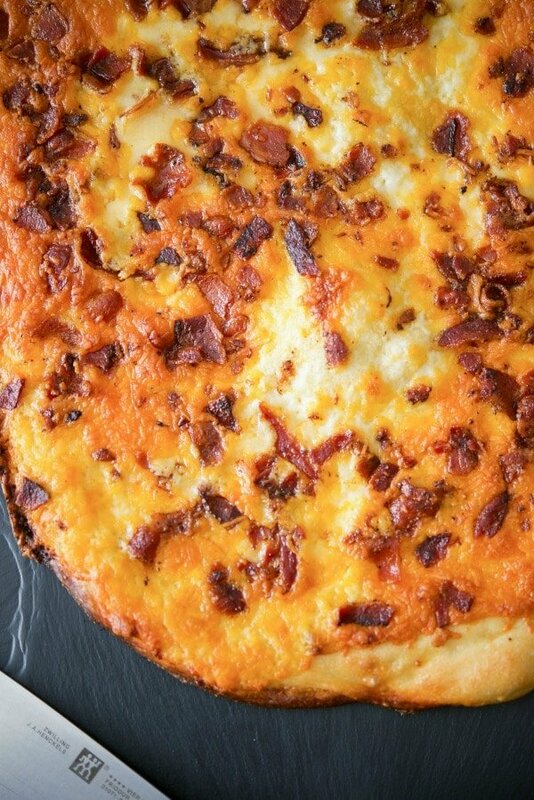 Which brings me to today’s recipe for Bacon & Cheddar Flatbread. When I purchase frozen pizza dough at my supermarket, it comes in a package of two, 1lb. pieces. A few weeks ago I made that Spinach, Goat Cheese & Kalamata Olive Flatbread and had the other dough left so I decided to use up some of the cooked Sunday morning bacon and shredded Cheddar cheese I had to make this new flatbread for lunch one day. It’s kind of funny because both my husband and I work from home and when it’s cooking day, he never knows what I’ll be bringing him when I’m knocking on his office door. 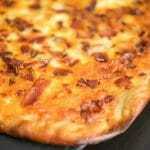 I have to say he was pleasantly surprised when I brought him this Bacon & Cheddar Flatbread for lunch! 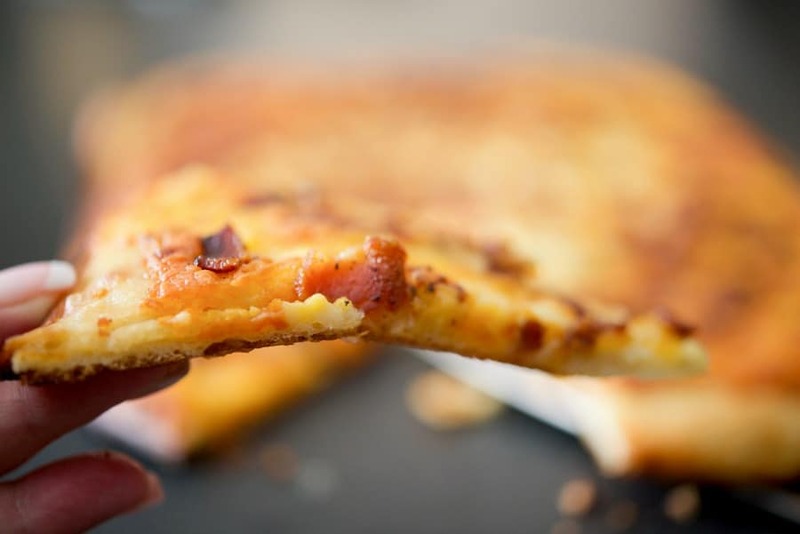 For this recipe you’ll need pizza dough, cooked bacon, shredded Cheddar cheese and for the sauce you’ll need milk, flour, butter and prepared horseradish. 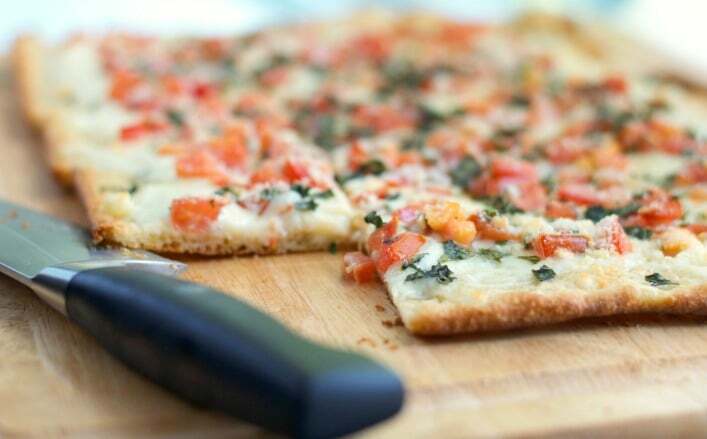 I like to add a little bit of a sauce to my flatbreads so it doesn’t taste dried out and they’re pretty simple to make. First, melt the butter in a small saucepan; then whisk in the flour forming a roux. Add your milk and horseradish and stir until the sauce has thickened slightly. Spread the pizza dough out on an old sheet pan with EVOO (this is my preferred method as the crust gets nice and crispy! ); then top the dough with the sauce leaving a 1″ border around the edges. Next, sprinkle on the cheese and bacon; then bake in a preheated 425 degree F oven for about 20 minutes or until the cheese is melted, hot and bubbly. To serve this Bacon & Cheddar Flatbread as an appetizer, cut it into 14 pieces or 8 pieces if you prefer this as a dinner portion. 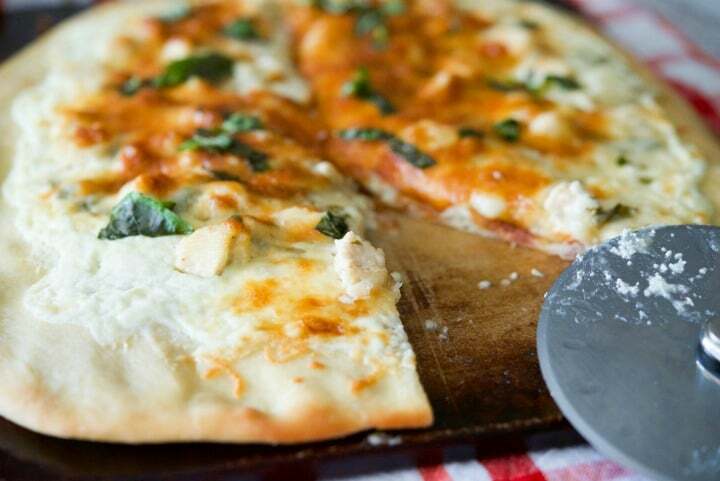 Either way, this flatbread was fantastic and loaded with flavor. Wrap the leftovers tightly in plastic wrap, freeze; then reheat any leftovers for a quick lunch, dinner or afternoon snack. ~Enjoy! Melt the butter in a small saucepan; then whisk in the flour forming a roux. Add your milk and horseradish and stir until the sauce has thickened slightly. Spread the pizza dough out on an old sheet pan with EVOO (this is my preferred method as the crust gets nice and crispy! ); then top the dough with the sauce leaving a 1" border around the edges. Next, sprinkle on the cheese and bacon; then bake for about 20 minutes or until the cheese is melted, hot and bubbly. 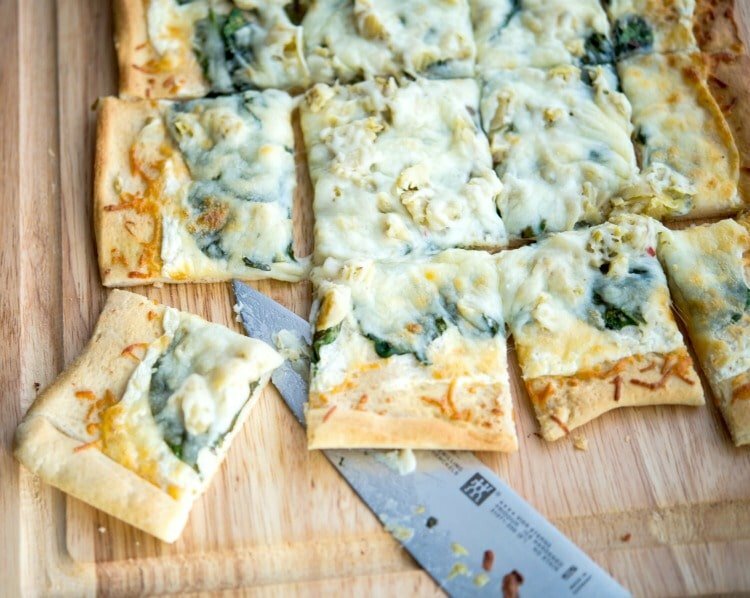 Cut into 14 slices for an appetizer or 8 slices for a lunch/dinner portion.